There is an SL9B! It is fun! There is an SL9B birthday celebration thing going on! It is great! Go read what I dunno Chestnut an’ Honour are saying ’bout it, ’cause I am too busy riding around in the lil pods an’ looking at the pretty lights an’ colors. Altho’ I’m usually due to some quirk of personality seen running quickly in th’ other direction when there are Organized Events like this, for some reason tonight it made me Extremely Happy With SL An’ My Fellow Resies to sit in th’ pod an’ look at all the cool stuff. No idea what 99% of it was, but it was pretty, an’ there was lots of it, and lots of people wandering about building it an’ looking at it an’ stuff, an’ trying to get the media stream working on the main stage, an’ dancing an’ wearing funny clothes. It all seems just so Well Done, and by so many Good Hard-working People. Made me smile hugely. 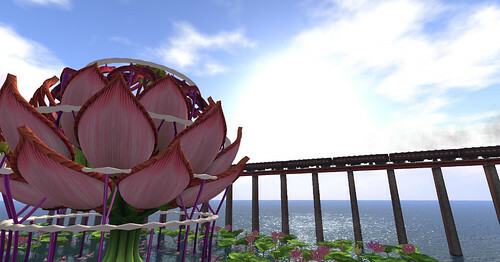 The giant water lily is the main stage. I think. :) Hafta go up and explore that train up on the huge giant railroad bridge sometime. Or jes be happy that it is there, an’ other people are exploring it! Happy Ninth Birthday to SL, everyone! We have made me proud.